Advanced multi-protein formula supplying your muscles with 25g of high-quality protein per serving. Nutrex Mass Infusion Gainer was specially designed for those who find it hard to gain quality weight but still want and deserve to look impressively big with forged muscles standing out. How Does Nutrex Mass Infusion Gainer Help? Gaining weight is not always easy. Some people simply don’t have much appetite or can’t make themselves eat as much as needed or have problems in absorbing nutrients. That’s why a product such as Nutrex Mass Infusion Gainer can help. It’s easy to prepare, to carry and to take. With just one serving you will be able to increase your calorie intake with minimal effort. This product offers you 1120 calories per serving to give your body a source to create weight from. But it also has other essential elements that you may need to become bigger and stronger. What Makes Nutrex Mass Infusion Gainer Different? A Variety of Protein Sources. The supplement relies on proteins from whey isolate, hydrolysed whey and micellar casein, something that will produce different effects in terms of protein delivery into the bloodstream – immediate and long-lasting ones. With protein you will ensure that you will be giving to your muscles what they need to grow and to recover, just combine this product consumption with a well-structured workout plan. Complex Carbohydrates. Good carbohydrates should not only fill you with energy - they should do it in the right way.This powder offers carbs with different levels of absorption, to quickly replenish your energy levels, but also to make sure that you have energy stored to be used when you need it. Delicious Flavours Available. You are bound to get a pleasant taste experience alongside with the benefits listed above. Nutrex Mass Infusion Gainer is all about helping you finally look different with ultimate care about your health and wellbeing. Have a question about Mass Infusion Gainer? What is it, what does it do, how and when to use or something else? Ask us. 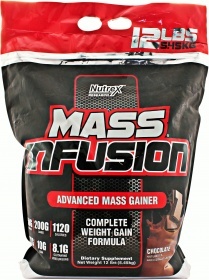 “Mass Infusion Gainer 5.45kg” is currently out of stock. Enter your details below and we will let you know when it's back in stock. Ingredients and values for Chocolate variant. Other flavors may vary. ALLERGEN INFORMATION: Contains Milk, Soy and Tree Nuts (Coconut).,Produced on equipment that also processes peanuts, tree nut, egg, wheat, sesame, and shellfish. Mix 1 serving (4 scoops) with 600 ml of water or milk and consume either in the morning, between meals, after a workout or before bedtime. Mix thoroughly and adjust water or milk amount as needed. Due to its highly concentrated nutrients you can start off with just 1/2 serving and gradually increase to a full serving.